Discussions of evolutionary topics, the ongoing conflict between science and religion, the Creationism/Evolution debate, and science and modern society. The Sea Mink of the coastal islands off Maine (and Canada) is an example of a mammal that appears to have invaded the sea sometime around 10,000 years ago to travel to islands of the coast of Maine. It flourished there until about 1860 when intensive hunting resulted in its extinction. No specimens were collected and placed in museums, and almost nothing is known about it. The sea mink came to the attention of the scientific world in 1903, when Daniel Webster Prentiss published a short article in the Proceedings of the U. S. National museum entitled "Description of an Extinct Mink from the Shell-Heaps of the Maine Coast". In it he described a single specimen from a shell midden at Brooklin, Hancock County, Maine. It was very similar to the skull of the mink, Mustela vison, but significantly larger. Prentiss named it Lutreola macrodon. Prentiss did not speculate on its ecology. Frederick B. Loomis, then at Amherst, described much more abundant remains of the giant mink in 1911 in the American Journal of Science. These were recovered from a shell heap on Flagg Island, Casco Bay, Maine. Loomis had the remains of at least 45 individuals available to him for study, including 34 lower jaws of males and 11 of females. Apparently unaware of the prior description of Lutreola macrodon by Prentiss 8 years earlier, he named the sea mink as a new subspecies of the mink - Lutreola vison antiquus. Loomis also did not speculate of the biology of these animals beyond noting their large size, although his illustration [see below] does document the appreciable sexual dimorphism in this species. The first extensive modern treatment of the sea mink was by Richard H. Manville, then Director of the Bird and Mammal Laboratories of the US Fish and Wildlife Service, and a research associate at the Smithsonian. In 1966, he published a description of all specimens known by then, which included many not available when Loomis published. He summarized data published by others, and provided previously unpublished historical data from hunters documenting how the sea mink was hunted. One hunter said that he had seen no specimens of the sea mink after about 1860; another said he had encountered them up until about 1880. Manville speculated on the natural history of the sea mink, noting that "because of its large size, [it] was pursued avidly for its pelt. Its seashore habitat rendered it relatively easy to capture. Overly zealous hunting, and possibly other factors of which we are unaware, led to its diminution and, ultimately, to its complete replacement by other, smaller forms of mink..... All the evidence indicates to me that the sea mink is most realistically considered as a subspecies, now extinct, of the prevalent mink, Mustela vison, of today." Jim Mead, then at Northern Arizona University, with two co-authors, published a review of the sea mink in 2000, validating it as a species, Mustela macrodon. Work published that same year, 2000, separated both Mustela vison and Mustela macrodon into a new genus, Neovison. The sea mink is now Neovison macrodon. Some workers continued to question whether mere size difference was enough to justify a separate species for the sea mink, including Russell Graham in 2001. Rebecca A. Sealfon published a detailed analysis of the teeth of the sea mink in 2007, showing that there were significant differences in the shape of the teeth from the mink to support the sea mink's status as a separate species. Unfortunately, Sealfon did not include any specimens of Neovison vison ingens, the Alaskan form to which the sea mink is likely most closely related, in her analysis. Even today, there has been very little published concerning the diet and behavior of the sea mink. It is said to have inhabited rock crevices on the islands and to have been very easy to hunt - and was done so to extinction. Several workers have suggested that it ate fish and marine invertebrates (shellfish). Sealfon in her 2007 study showed that the sea mink had smaller cutting/shearing ability, and greater crushing ability, in its teeth as compared to the American mink, supporting this hypothesis. The only subspecies of the brown mink which is as large as the sea mink is Neovison vison ingens, from Alaska. Mead speculated that "The Sea Mink is a relict of a M. vison ingens, or ingens-like, form that existed along the fringes of the late Pleistocene continental glaciers, of North America. Post glacial climate has restricted this "larger than normal" form to Alaska-Yukon and led to a North Atlantic isolate that contrasts with other members of the genus." A claimed taxidermy mount of the sea mink has been shown to be a large individual of the brown mink. There is much we do not know about the sea mink. We may never know. But the sea mink was a terrestrial carnivore which successfully invaded the sea, and as such, can serve as a model of how animals such as seals and sloths may have begun their marine lives. 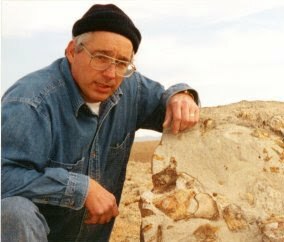 I'm a retired museum director and a vertebrate paleontologist. I've worked mostly in the American Southwest, and in Mexico. I've studied Neogene faunas, the Great American Biotic Interchange, and have worked with fossil turtles, fossil armadillos and their extinct relatives, and especially with pronghorn antelope and deer, and their fossil relatives. I've been involved for more than 20 years in discussions about evolution and creationism, and how individual views on science and religion can be reconciled with each other. (C) Richard S. White.. Watermark theme. Powered by Blogger.